Robert Brown (1827), an English botanist, observed that pollen grains sprinkled on the surface of water, when viewed under a microscope, moved in a random fashion. This was the first visual indication of the molecular structure of matter. Each pollen grain was being unequally bombarded by the water molecules in motion. This causes the pollen grains to 'random walk' on the surface of the water. The violet-colored circle is centered on the origin and the black dot on the circumference is the walker at the end of the 1000-step walk. The blue-colored circle is the distance from the origin the walk is expected to end on. This expected distance is computed from d = L√n where L is the average step length and n is the number of steps per walk. In this project, L = 3. The closer the circles, the closer the agreement between theory and experiment. The project can be viewed and downloaded by clicking on the link below the graphic. This project is the 2-dimensional version of my 1-dimensional project, Feynman's Random Walk, that can be viewed at https://scratch.mit.edu/projects/11282377/. The Scratch blog post can be seen by clicking on this link. 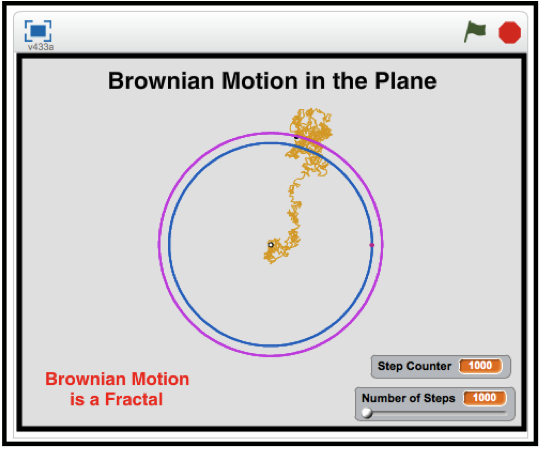 A free PDF document that describes Brownian Motion in more detail and explains the coding can be had by sending an email request to grandadscience@gmail.com.